University of Cincinnati in the sport of track and field. Mary competed at the 2008 Summer Olympics in Beijing, China and brought home the Gold in the 4 x 400 meter relay. 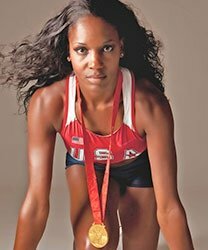 She ran the first leg in the prelim and final round in August of 2008 to secure a gold medal with her other 3 teammates for Team USA.